Make your home an intimate retreat that will please your senses and nourish your soul. Here’s how to make your home a sacred space... a sanctuary for mind, body, and soul. HOME SANCTUARIES gives you an easy-to-follow, seven-stage process for building personal retreats, altars, and shrines within your home. You will learn how to identify a location, cleanse and sanctify the area, evaluate the balance of energy, assemble materials, and energize your intentions. Using this book, you will discover how every room in your home can become a place to increase serenity, mindfulness, and expression, reduce stress, and build harmony. It provides an easy-to-follow, seven-step process for building personal retreats, altars, and shrines. Everyone seeks love, joy and abundance in their lives. Simple Feng Shui takes this ancient eastern concept of furnishing-for-success and shows how easily it can be applied to the American home or office. Author and leading feng shui consultant and practitioner Shawne Mitchell combines images with plain language to explain concepts that Americans can put to work immediately. Hundreds of practical tips, insightful stories, and life lessons help guide readers. 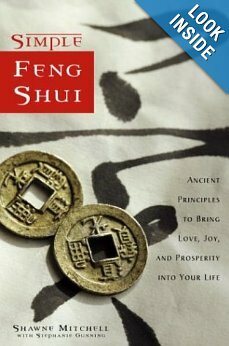 This is an introductory, yet detailed handbook that communicates the essence of Feng Shui in plain language and images that contemporary Americans can easily understand and put to work immediately. Shawne Mitchell helps readers grasp the ABC's of Feng Shui, while showing simple ways to read and shape the invisible energy in home and office to manifest success and abundance, find and maintain loving and nurturing relationships, and enjoy true happiness and well-being.